Arsenal manager Unai Emery has sent a message to Aaron Ramsey over what he expects from him for the rest of this season. The Wales international’s contract is due to expire in the summer and BBC Sport are among those claiming he’s set to leave Arsenal. 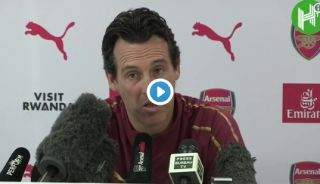 Emery did not deny this and simply states in the video below that he still expects a strong level of performance and concentration from the player. On top of that, Emery has also hinted as to the reason for Ramsey choosing to leave the Emirates Stadium. BBC Sport claimed Arsenal withdrew a contract offer for the 27-year-old, and Emery’s words suggest his wage demands may have been too high. ‘In the football years I knew, and I am going to know, the same situation,’ the Spaniard is quoted in the Daily Mirror. Ramsey will be a free agent this summer and looks a superb potential signing for any top club that can win the race for his signature on a free.